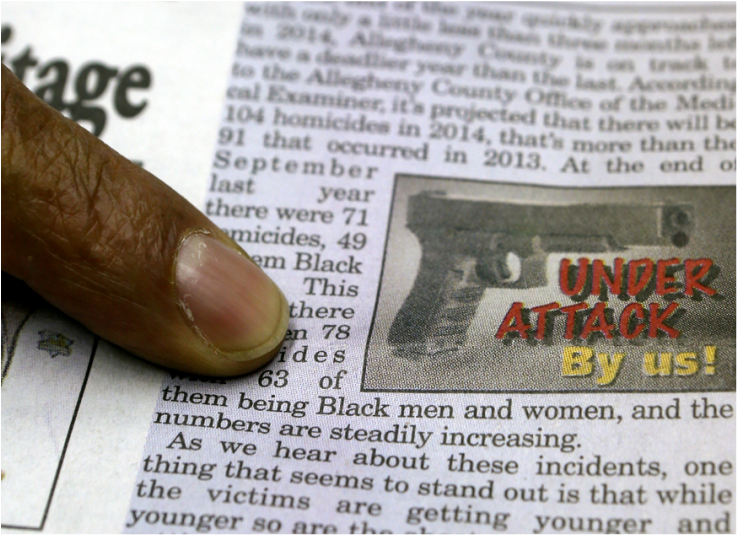 PITTSBURGH (AP) — At the start of every month, the same image of a pistol points from the same place on the front page of the New Pittsburgh Courier, above the same caption: Under Attack By Us! The only thing that changes is the number of the dead. “75 of 91 homicides Black lives,” read a recent headline in the renowned Black newspaper’s crusade against Black-on-Black violence. It was accompanied, as always, by a literal body count: The name, race and manner of death for every homicide in Pittsburgh in 2014 — with victims being overwhelmingly Black, as the headline shows. For years across the news media, stories have focused on cases like the killing of Michael Brown, the unarmed Black 18-year-old, by a White police officer in Ferguson, Missouri. And for years, the Courier has kept asking: What about all these other Black lives lost? That gun on its front page might as well be a finger pointed at Black America — from a mirror. “We are challenging the community to own this problem,” says Rod Doss, editor and publisher of the 107-year-old weekly newspaper, which sometimes does an in-depth story on a particular victim but unfailingly updates and reprints its list, including whether anyone has been arrested. The campaign began almost a decade ago because editors at the Courier simply felt Black-on-Black killings were not getting the attention they deserved. At first, it met with strong resistance from the paper’s readership — “almost like we were uncovering dirty laundry. Nobody wanted us to talk about it,” Doss says. Slowly, though, that attitude started to change. The number of rallies and vigils increased. Mothers of the dead banded together to try to stop the tragedies. Police were pressured to solve more of the murders. The Pittsburgh metro area, population 1.2 million, is vibrant after rebounding from the collapse of the steel industry in the 1970s and ’80s. But poverty and violence still afflict Black areas such as Wilkinsburg, Homewood, East Liberty and the fabled Hill District, where the playwright August Wilson was born, Louis Armstrong blew his trumpet, and baseball legends Satchel Paige and Josh Gibson played. The metro area’s annual number of homicides has ranged from 71 to 120 between 2007 and 2013. In 2013, the homicide rate of 4.1 per 100,000 residents was 12th highest in the nation, according to FBI data, but well below that of the worst metro areas, Baltimore (10.0) and Detroit (9.6). In Pittsburgh and many other big cities, most of the homicides are Black males killing each other. Rashad Byrdsong, a Pittsburgh native and leader of the Community Empowerment Association, has worked for decades to help stop the violence through myriad efforts, from hands-on street conflict resolution to hiring minority residents to work for his own construction company. He is the type of grassroots activist, common in cities across America, whose efforts are often overlooked when critics say that the Black community only cares when a White person kills a Black person. A recent example of this criticism came when former New York City Mayor Rudolph Giuliani appeared on “Meet the Press” to comment on nationwide protests over a grand jury declining to indict the officer who killed Brown in Ferguson. “What about the poor Black child that was killed by another Black child? Why aren’t you protesting that?” Giuliani said. “Why don’t you cut (the homicide rate) down so that so many White police officers don’t have to be in Black areas?” Giuliani continued, speaking to a Black panelist. Byrdsong has been trying to do exactly that. He supports the Courier’s focus on the killings, but argues there is a broader narrative that also must be addressed. He calls it “social violence”: few opportunities for early childhood development; over-prescription of drugs like Ritalin to Black boys; high rates of school suspensions and expulsions; racial profiling; disproportionate unemployment and incarceration; and more. These structural barriers may help explain why few confront black-on-black killings as forcefully and repeatedly as the Courier does. Many Black advocates believe obstacles to Black advancement are the root cause of such killings, and that eliminating them should get the bulk of attention. They say blaming the problems of poor Black communities solely on the behavior of some residents comes uncomfortably close to the view of certain White critics (and some Black ones) that poverty and a lack of opportunity had nothing to do with bad choices. On the other hand, some advocates downplay Black misbehavior, suggesting that racial obstacles cannot be overcome through good choices. Those who do mention Black behavior can be castigated for “blaming the victim.” Even President Barack Obama has been stung by Black critics for sprinkling talk of “responsibility” into his rare racial speeches. Stephan Broadus, the Courier’s assistant to the publisher, thinks the Black community has become resigned to violence. “Another Black kid gone, no big deal. Another Black kid in jail, no big deal,” he says, summarizing that view. “We’ve become numb,” says Ashley Johnson, the Courier reporter who writes the Under Attack stories. And what makes the Courier feel it can challenge its readers with coverage that is unsparing and painful to read? It’s because of the paper’s record of deep, longstanding support. Since its founding in 1907, perhaps no newspaper has done more to advocate for Black people. Anti-discrimination, political empowerment, health care and housing were just a few issues the paper championed in its early years. It fought for the desegregation of professional sports. Courier sportswriter Wendell Smith is credited with recommending Jackie Robinson to Brooklyn Dodgers owner Branch Rickey, and Smith then chronicled Robinson breaking of baseball’s color barrier, even rooming with him on trips to segregated areas. During World War II, the Courier’s “Double V” campaign published weekly stories advocating “for victory at home against prejudice and discrimination as well as victory abroad against the enemies of democracy,” as one article stated. W.E.B. DuBois, Marcus Garvey, James Weldon Johnson and Zora Neale Hurston all had bylines in the Courier. At its height, the paper was distributed nationwide, and its local and national editions had a circulation reaching 350,000. The Under Attack By Us series is a continuation of this legacy. And it’s making a difference, people say. Doss, the editor and publisher, says the role of the Courier has always been to take the lead on important Black issues — popular or not.